Vitamin B-12 is dietary or supplemental nutrient that you rely on for bodily processes that include red blood cell and DNA formation, as well as normal function of your nervous system. If you have a B-12 deficiency, you can develop a number of symptoms related to neuropathy, or damage to your nerve function. 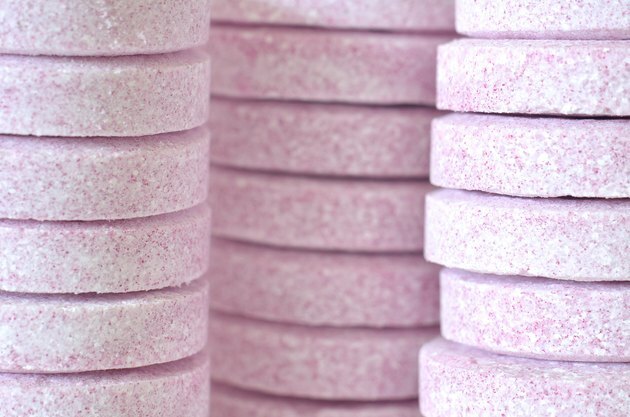 Adult and teenage males and females need to get at least 2.4 mcg of vitamin B-12 every day, according to standards established by the National Academy of Science's Institute of Medicine. Younger children need lower amounts of this vitamin, while pregnant and lactating women and teens need slightly more. People age 50 or younger can typically get their B-12 from food sources of the vitamin, including fish, shellfish, meat, poultry and milk. However, people over the age of 50 frequently have problems absorbing B-12 directly from natural food sources and need to eat B-12-fortified foods or take B-12 supplements. You need B-12 to form structures called myelin sheaths, which protect the outer surfaces of your nerves. If you develop a B-12 deficiency, you can develop damage in the myelin that covers the nerves in your brain and spinal cord, as well as the nerves that extend from your spinal cord. Potential symptoms of this damage include tingling and numbness in your legs and arms, walking difficulties, disorientation, loss of memory and a form of dementia that can occur on its own or with associated mood changes. Typically, these symptoms develop gradually if your B-12 deficiency goes unaddressed. People with B-12 deficiencies can also develop a red blood cell disorder called megaloblastic anemia. This condition occurs when lack of sufficient B-12 triggers deficiencies of another B vitamin, called folate or folic acid. In turn, folate shortages reduce your body's ability to produce the red blood cells you rely on to bring oxygen to your tissues. Doctors commonly use the presence of megaloblastic anemia as a main diagnostic indicator of abnormally low B-12 levels. However, roughly 25 percent of people with B-12 deficiencies don't develop anemia, Oregon State University's Linus Pauling Institute reports. As a result, it can be harder to uncover a deficiency before nerve damage begins. It is often possible to reverse the nerve-related effects of a B-12 deficiency with B-12 injections or high doses of oral supplements, according to the National Institutes of Health's Office of Dietary Supplements. However, you can also develop permanent nerve damage if you don't receive proper treatment within a certain amount of time. If you have a B-12 deficiency combined with an unusually high intake of folate or folic acid, you can reverse the effects of any anemia-related symptoms without addressing the underlying deficiency. In turn, this situation can potentially increase your chances for developing undiagnosed nerve damage. Consult your doctor for more information on the nerve-related consequences of B-12 deficiency.